In the first week of the war, news came that the Suffragettes (the militant suffragists), currently serving jail sentences had been released from prison. Oldham’s Annie Kenney, along with Manchester’s Mrs. Emmeline Pankhurst and her daughter Sylvia, who were all subject to the ‘Cat and Mouse Act’ at the time, were also given their freedom. In addition it was learned that Mrs. Pankhurst’s eldest daughter, Christabel, who had remained in France since evading capture in March 1912 when a warrant had been issued for her arrest, would now be free to return to England without the risk of prosecution. These releases were a result of a re-orientation of the Suffrage and Suffragette movements as recorded in the annual report of the Oldham Women’s Suffrage Society published in October 1914. For the duration of the conflict and in line with NUWSS policy, the work of the society would lie in supporting the war effort rather than actively campaigning for women’s suffrage. In the opening months of the war the society had begun to organise the distribution of free milk, clothing and aid to the needy of the district. As in the past, Marjory Lees, President of the Oldham Women’s Suffrage Society and her mother, Dame Sarah Lees, were swift to offer their support when it was needed. Marjory paid for the free milk to expectant and nursing mothers in 454 families which, in the first 3 months of the scheme in 1914, amounted to 1,594 pints each week. The members of the Society also organised the distribution through their ‘visitors’ who also worked with the Oldham Committee for the Care of Women and Children, establishing clothing depots throughout the town to provide warm clothing for those in need. In addition, it is recorded that Marjory donated £1,000 to the Allies Relief Fund. In December 2014 Dame Sarah Lees presented the Oldham Branch of the St. John Ambulance Society with a fully equipped ambulance, which she named ‘The Oldham Suffragist’. 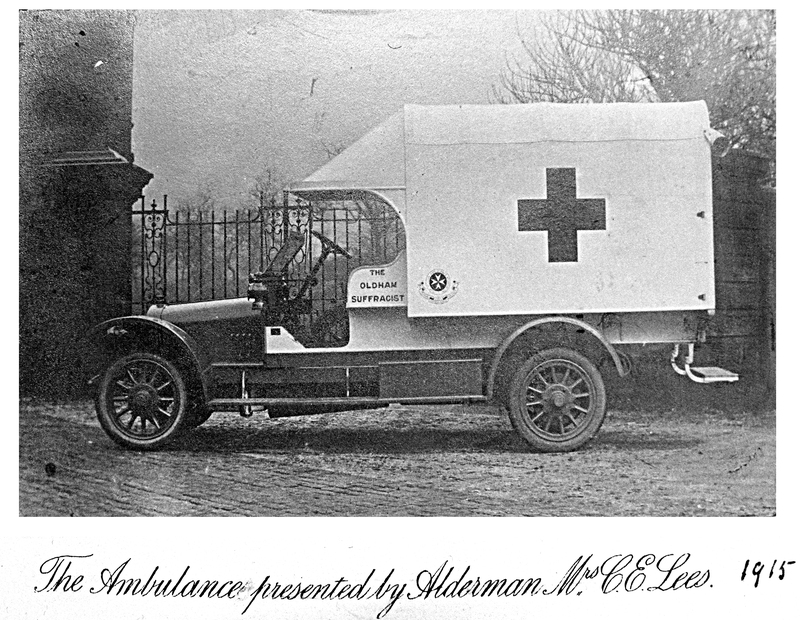 On one side of the ambulance was inscribed: ‘Presented by Mrs. C. E. Lees to the Oldham No. IV District ‘ and on the other ‘The Oldham Suffragist’. 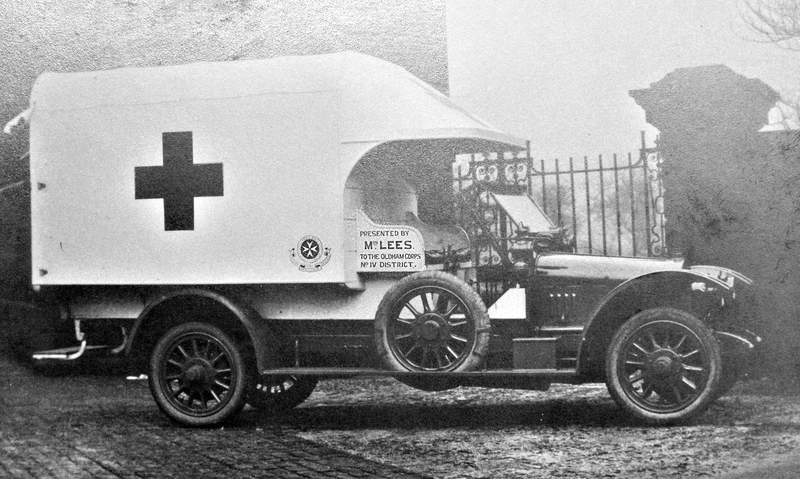 The ambulance, destined for the Front, was supplied by Oldham Motor Company. The presentation took place at WernethPark, the home of the Lees family, in the presence of numerous medical and civic representatives, 36 uniformed nursing sisters, and 30 men who gave displays of ‘ambulance work’. In his speech of thanks the President of the Oldham Branch of the Association spoke of the 6,000 ambulance certificates and orders of merit awarded; of the 42 Oldham men who had already joined the Royal Army Medical corps; of 26 ‘berth reserve’, the Royal Naval Auxiliary Sick Berth Reserve (RNASBR) attached to the navy; and 25 to the Royal Marines. There were also 70 men in training and ready to go as soon as orders were received. In addition there were over 30 women with certificates, 12 of whom had volunteered for service with the Red Cross in Belgium. Thanks for the great post Nicky, is there an email address I can reach you on? Would like to discuss something, many thanks!